This competition is now closed. We received a lot of thoughtful comments and great product suggestions, so thank you to everyone who entered. Congratulations to Mier Chan, who was selected as the winner. We are giving away a $30 credit at our kitchenware store. 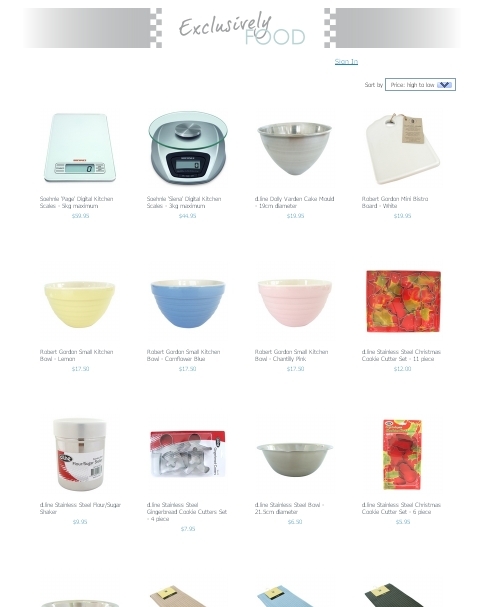 What products would you like to see available at the Exclusively Food kitchenware store and why? Competition closes 26 November 2010. We will select our favourite response and post the winner's name on this page by 29 November 2010. Products can be posted to Australian addresses only. If you live outside Australia, you can enter if you wish to have the products posted to a friend or relative who lives in Australia. Unless selected as the winner, entrants will not receive any correspondence from us as a result of entering the competition. The competition commences on 21 November 2010 and closes at 11.59pm AEDST on 26 November 2010. There will be one winner, who will receive $30 credit to be used at the Exclusively Food Kitchenware Store. The winner's name will be published on this page within three days of the competition close date. The winner will be notified by email. If they do not respond within two weeks, another winner will be selected. Extra large and deep glass/ceramic mixing bowl is a must in any kitchen. I have a small, medium and large pyrex glass bowls which are awesome. However, this time of year when I do some really serious cooking and baking I am needing a much larger bowl. My mother has just the bowl I am looking for and she had had hers for about 30 years and I love using it. Love what you have in your kitchenware store already Exclusively Food! Hmmm, how about a pocket sized Amanda and Debbie for instant advice, recipes and general kitchen assistance? No? Fair enough. I'd actually really like to see something in the way of a silicone wooden spoon. A wooden spoon is a kitchen essential, but I feel a bit funny about using the same wooden spoon for my baking that is also used for stir frys, sauces, pasta etc etc. Just seems wrong, I think wood remembers these things! So I would love a silicone wooden spoon that can be used for everything without making me shudder, rather than having to buy multiple wooden spoons and label them for their correct use!